The large tribe of Araucanian Indians of Chile and Argentina live in the area of the Rio Choapa and the Gulf of Corcovado. The tribe is subdivided into the Picunche, Mapuche and Huiliche who lived west of the Andes and the Pehuenche who lived in the central Chilean highlands. The Argentinian Araucanians live east of the Andes mountains. These tribes fought many bitter battles against the Spanish conquerors and were basically undefeated until late in the 19th century. 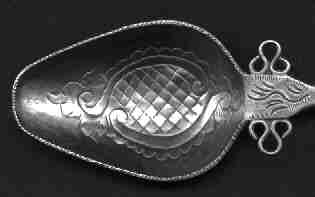 The "spoons" shown here are large, unmarked, hand made and are highly unusual. They do show some Colonial Spanish influences, but the designs are overwhelmingly indian origin. 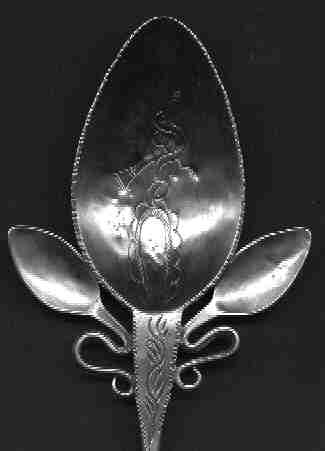 These spoons are not used for eating, rather they are decorative and used as a form of jewelry. These spoons contain obvious hammer marks and even when they appear to be identical they show many minor differences. While they are unmarked, they do appear to be silver although it is probably less than sterling quality.